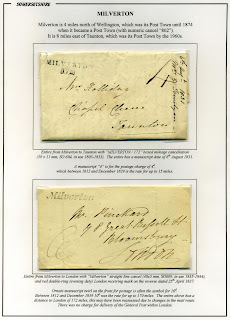 Somerset Postal History: Boxed Mileage Marks - "MILVERTON / 169" & "MILVERTON / 172"
Boxed Mileage Marks - "MILVERTON / 169" & "MILVERTON / 172"
Discovered at the Spring Stampex 1990 and described in an article in the October 1990 S&DPHG Journal (Vol.3-2), the handstamp was illustrated but unfortunately not the complete cover. The handstamp was used in 1801. 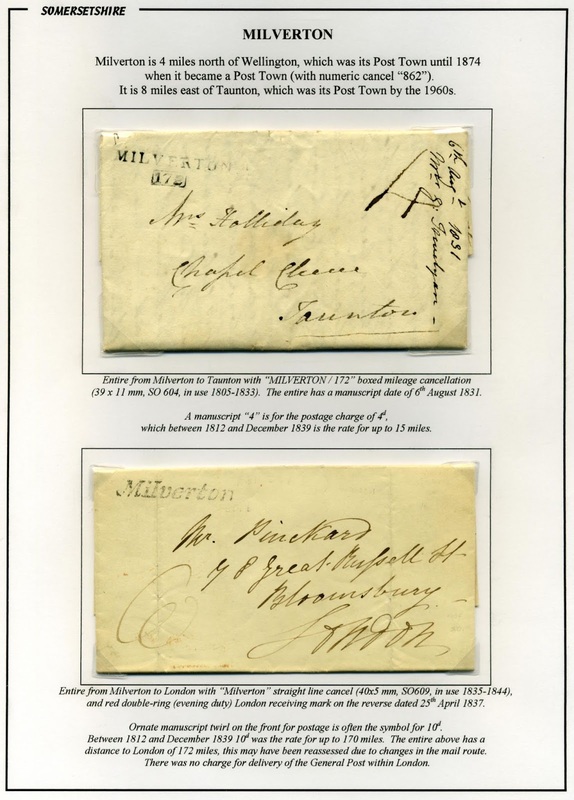 As described in an article in the September 1994 S&DPHG Journal (Vol.3-10), at that time Milverton did not have an official office and mail from Wiveliscombe and Milverton would be brought into Wellington by one messenger. The Milverton mileage mark was to indicate to the Wellington postmaster how to apportion the fees between Milverton and Wiveliscombe (so there may be a missing “WIVELISCOMBE / 169” to find). The '169' mileage in the Milverton handstamp would be the mileage for Wellington, though when the Wellington mileage mark was issued it was for '168' miles. This second handstamp dates from after an official Receiving House was set up in Milverton, and the mileage from Wellington was 'calculated into the entire distance each letter will be conveyed' [Freeling Reports 25 July 1804]. Extended date for SO 693 "SOMER / TON"
Boxed Mileage Marks - "TAUNTON / 161"
Boxed Mileage Marks - "MINEHEAD / 185"